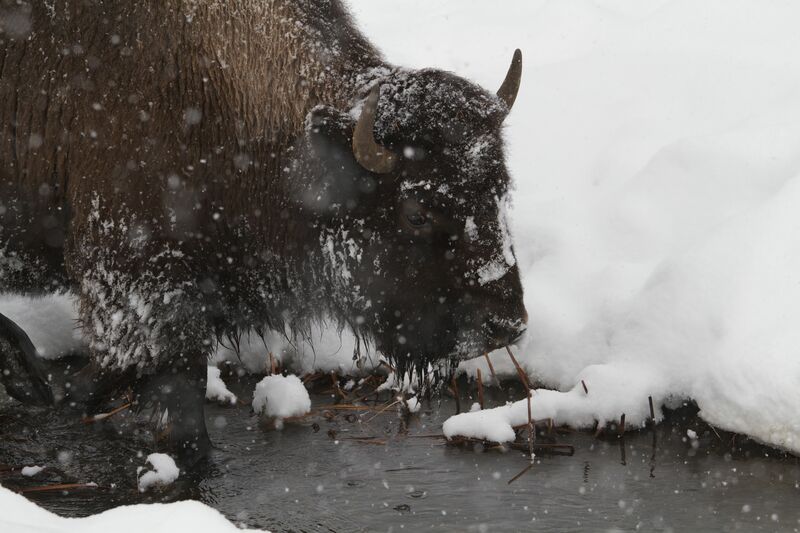 At Yellowstone Park (see my photo essay of recent trip) winter is a time of survival. The conditions are harsh and life must adapt to survive. In fact after the long, cold winter many animals who are at less-than-peak fitness die and springtime reveals thawed out expanses littered with dead animals. So nature has devised strategies for survival. The bison, for example have developed a dense shag and a dark color that absorbs almost all of the precious sunlight. They can continue to forage under the snow on soggy grasses, unless there’s a very hard freeze, in which case they cannot push the snow aside to reach the grass, and cannot eat. They have lots of body fat stored and can run temporary deficits in calories to survive. Other animals, such as the grizzly bears, hibernate through the winter to conserve energy. Marmots go into deep hibernation, reducing their metabolism by 80%. The sleep is so deep that they cannot be woken up during hibernation. But the most astonishing strategy is adopted by the boreal chorus frog (and some of his kin in other parts of Montana and Canada, such as the wood frog). The boreal frog literally allows itself to “die” for the winter! As winter approaches it creates a shallow burrow of dead leaves, sneaks underneath and freezes over. Literally, it looks like a chunk of ice in the shape of a frog. Its metabolism stops – no heartbeat, no blood circulation, no oxygen transport. No respiration. All the functions that we associate with life are absent. It’s not merely hibernating, it is almost literally dead. You can kick one and it will be like you kicked a block of ice. Then, when the thaw sets in at winter’s end, the boreal frog miraculously resurrects itself! The water in its body melts again and it somehow restarts its heart and metabolic activity. It’s alive again! This is not waking up from deep hibernation, this is resurrection from the dead! For normal living beings like you and me, if we froze the water in our body cells, the cells would explode and die. There would be no building them back again. 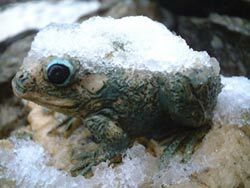 But the boreal frog has adapted by developing a special gene that sets processes in motion to expel all the water from the cells and lets the water freeze outside its cells. The cells are completely desiccated and inert during the freeze but they are technically still “alive”. After the thaw the gene sends a signal to restart the heart and for the water to rehydrate the cells. Viola! A live boreal frog ready to feast on the plentiful mosquitos and other insects of spring and summer. Nature is magical. There is evolutionary beauty and elegant solutions to impossibly harsh environmental challenges. Somehow life clings to every niche no matter how inhospitable. The boreal frog, whose habitat we were lucky enough to visit, is a wonderful example. This entry was posted in Evolution, Photography, Science, Travell. Bookmark the permalink. 7 Responses to Resurrection – A Natural Adaptation in Yellowstone! Waw!!! That is amazing to hear about the boreal frog !!! How the nature devises the strategy for the survival of different species !!!! Wow! It is quite astonishing that such a mechanism also exists to survive. Wonder when they can implement the same for humans. Good to finally hear from you. I hope you and Arsh are doing well. In Bhutan we were told that some yogis can slow down so much during meditation that they need only one small meal per month. Apparently human beings are quite capable of regulating their metabolism almost to a stop. We need to learn from this if mankind really wishes to do serious space travel!! Thanks for sharing the boreal chorus frog story with us. I would not have thought such an adaptation possible. Nature in all its variety constantly amazes. And it goes to show that there are unimaginable, new things for us to learn all around us. The photo journey of Yellowstone was breathtaking. I particularly enjoyed your slide/video show put to music. Your creativity and thirst for the new and unique continues to delight and enrich me!